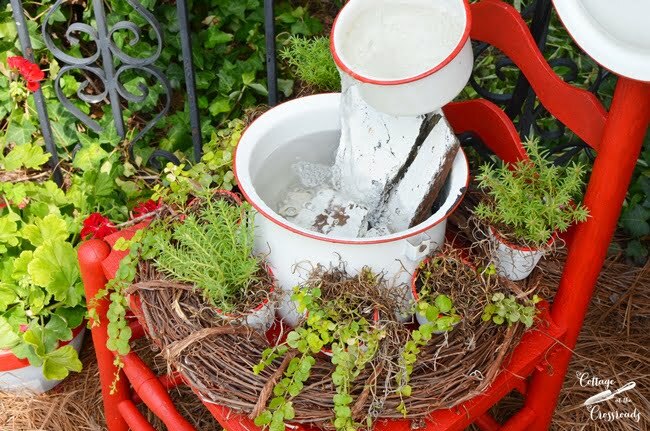 You are here: Home / DIY / Enamelware Chair Fountain and a Giveaway! I’m giddy with excitement over our newest creation! 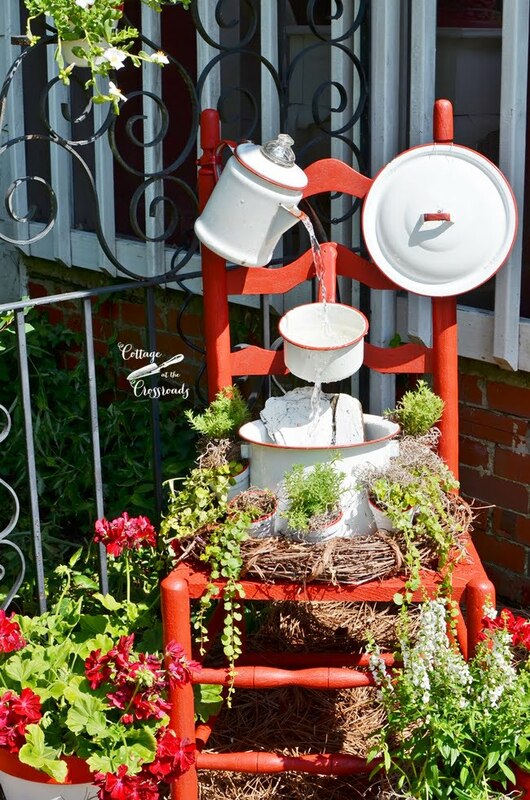 We took an old chair and some pieces of vintage red and white enamelware and came up with this enamelware chair fountain! Well, time and weather had taken its toll on the old rush seat, and it did take a bit of time to cut all that off the chair bottom. After that, I was able to paint the chair with some red paint that matched the red on enamel chamber pot. 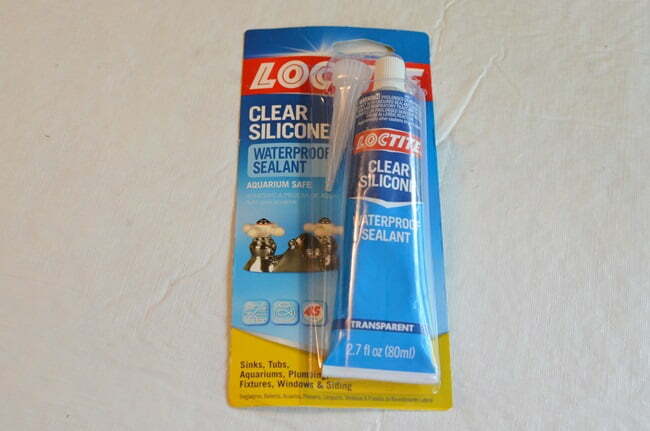 The chamber pot had a pinhole leak in the bottom so I fixed that with this waterproof sealant. I need to explain to you why we placed the enamelware chair fountain into this corner. You see, Leo and I are BIG coffee drinkers, and the very first place we head to in the morning is our front porch where we enjoy several cups of coffee before we start our day. So I thought how wonderful it would be to enjoy the sound of babbling water as we have our coffee. Since we’re coffee drinkers, I found a vintage enamelware coffee pot on eBay, and here you can see Leo attaching it and another piece to the old chair. He did have to drill a hole into the back of the coffee pot in order to run the tubing into it. First he created a pilot hole with a nail and then used a metal bit to make a large enough hole to accommodate the 1/2 inch size tubing. Be sure to rinse out the pot after creating the hole because we found that little bits of metal had dropped down inside when he was reaming out the hole for the tube. 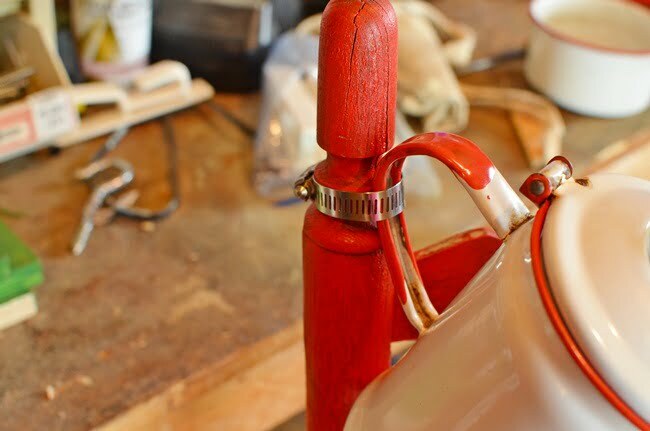 You can see that he used a hose clamp to attach the handle of the coffee pot to the chair. Now here is the heart of the whole fountain. 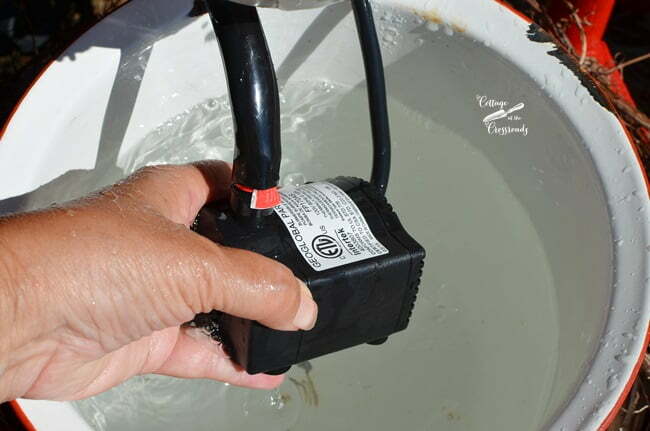 This low-water auto shutoff pump (model #FP170AS) eliminates the worry of burning up a pump if the water level in your fountain gets too low. I’m so glad that smartpond came up with the technology for the pump to automatically shut off! One less thing to worry about, right? Then we filled the chamber pot with water, placed the pump in the bottom of the chamber pot and plugged in the electrical cord that’s attached to the pump. In the photo above, you can see how the tubing runs from the pump, out the chamber pot, and then up to the coffee pot at the top. I camouflaged some of the tubing and the piece of plastic used to get the right angle of the pot in the middle by painting them red. To hide the tubing in the chamber pot, I placed some painted rocks down inside. (No, I didn’t paint the rocks just for this purpose! It’s a long story as to how those rocks got painted!) 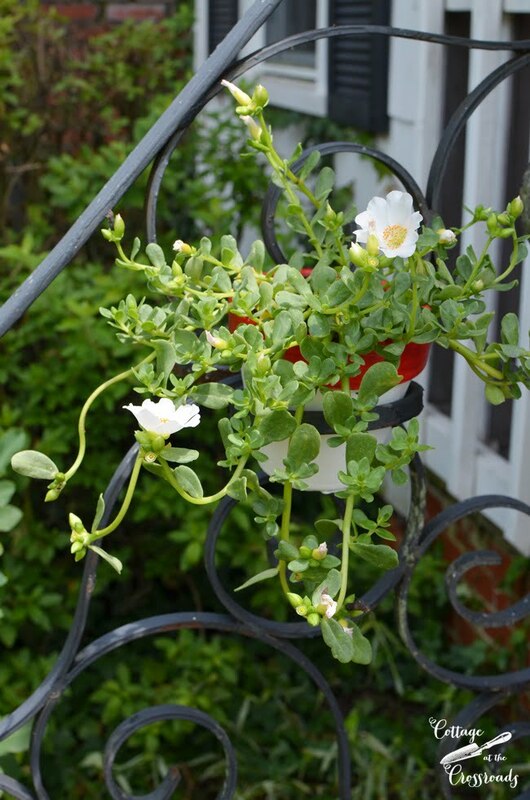 You may notice a grapevine wreath surrounding the pot. It camouflages the wood that Leo screwed into the bottom of the chair after I took out the rush seat. The grapevine wreath looked like it needed a little something so I painted some small terracotta pots to look like vintage red and white enamelware. That did the trick so I just couldn’t stop myself! I painted up some larger pots to place around the base of the chair. 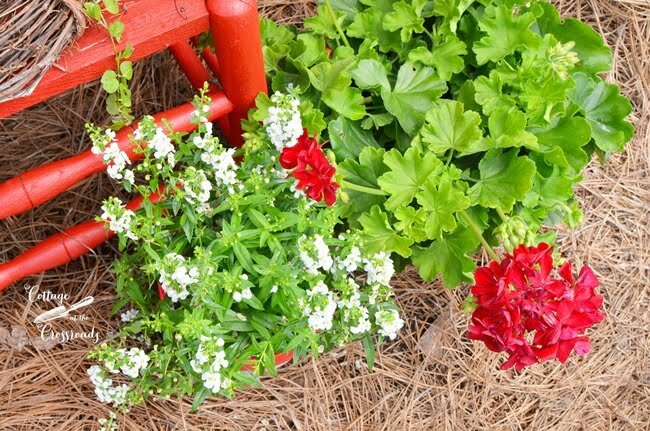 The white flower is angelonia which does very well in our heat here in South Carolina, and nothing says summer more than red geraniums. 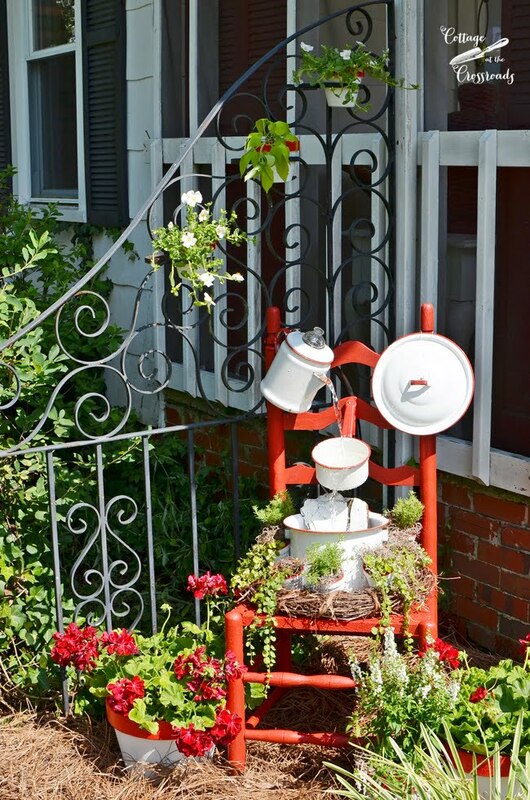 The enamelware chair fountain is tucked into this corner which has part of a wrought iron gate attached to the house. We bought this piece when we lived near Charleston, SC and brought it with us to the Crossroads. I planted some heat loving flowers and a sweet potato vine into those. 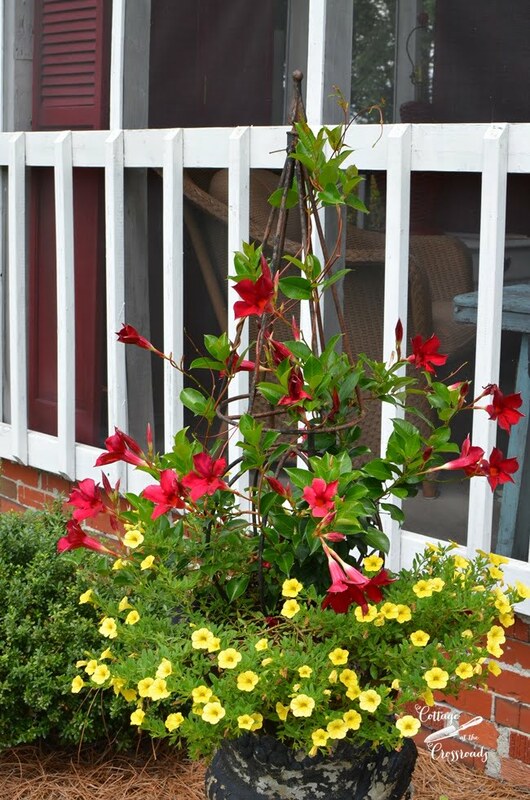 You may remember that I have a red and yellow flower scheme going on around the front of the house, too. I just cannot tell you how delighted I am with how everything turned out. 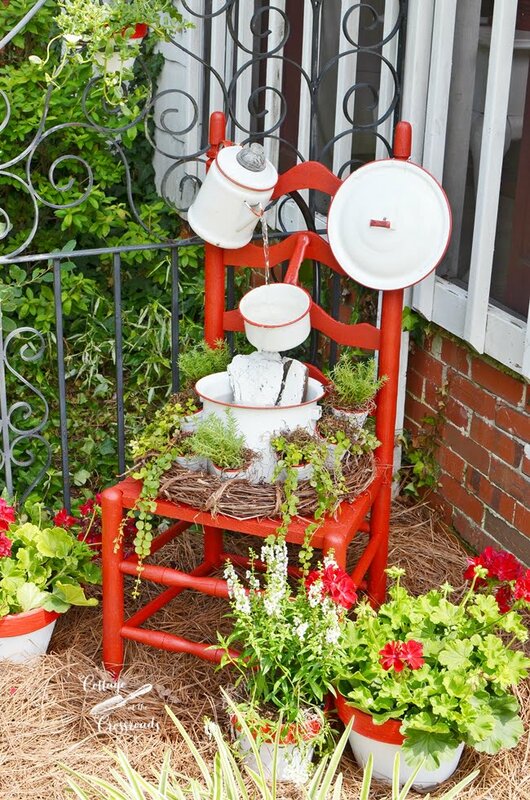 The enamelware chair fountain has increased our porch sitting pleasure, that’s for sure. It really was so easy to create this fountain. 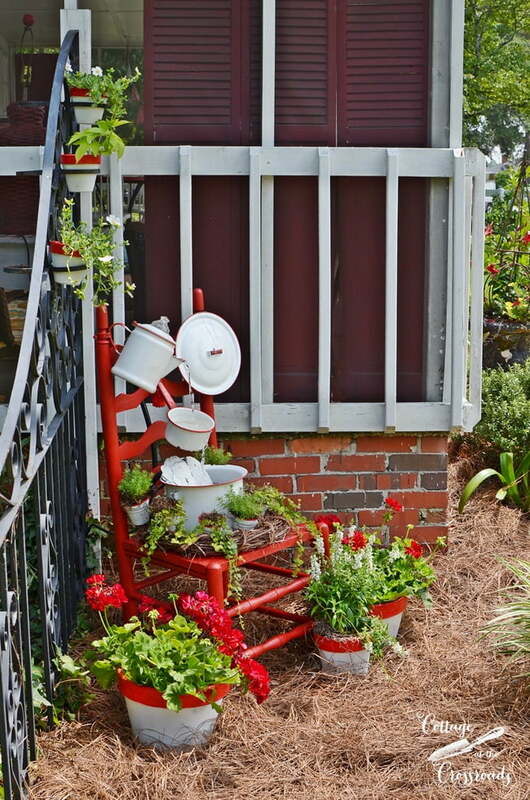 Start looking around for an old chair and some pots and pans to create yourself one! I’m already thinking about creating a blue version to place outside my mom’s apartment. There really is nothing more soothing than the sound of trickling water, is there? 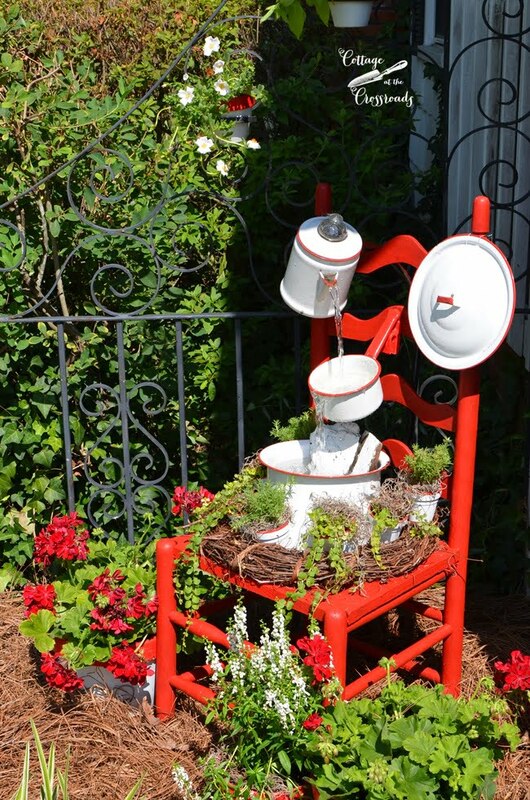 Thank you so much for pinning our enamelware chair fountain, and I hope it’s inspired you to create your own. If so, you’re in luck because the generous folks at smartpond are giving away several of the exact same pumps that we used to our readers. Just leave a comment below and we’ll randomly choose some winners on Friday, July 7. (Only US residents are eligible to win.) If you cannot wait to hear if you’ve won, you can find the pump and the tubing at your local Lowes store. To see another smartpond project that we completed, click HERE. Before you go, leave us a comment so that you’ll be entered into the giveaway! So sorry you missed the giveaway deadline! A winner has already been selected. The pumps are relatively inexpensive and you can find them at any Lowe’s. I Love ❤️ that it is Exactly what I would have done! I too love the sound of trickling water. I have migraines and that is very soothing to me So glad I found your blog you are so creative! Your fountain turned out so beautiful! I love that the water is poring out of the kettle! I have always wanted a fountain! I love your chair fountain! You’ve captured my heart with this one! So many favorites, how do I choose? RED, WHITE, & YELLOW! A winning combination anytime! Vintage? Every time! LOVE, LOVE, LOVE!!! This is so creative. I can’t wait to make my own. Thank you for sharing. That is adorable! Now I want one!!! 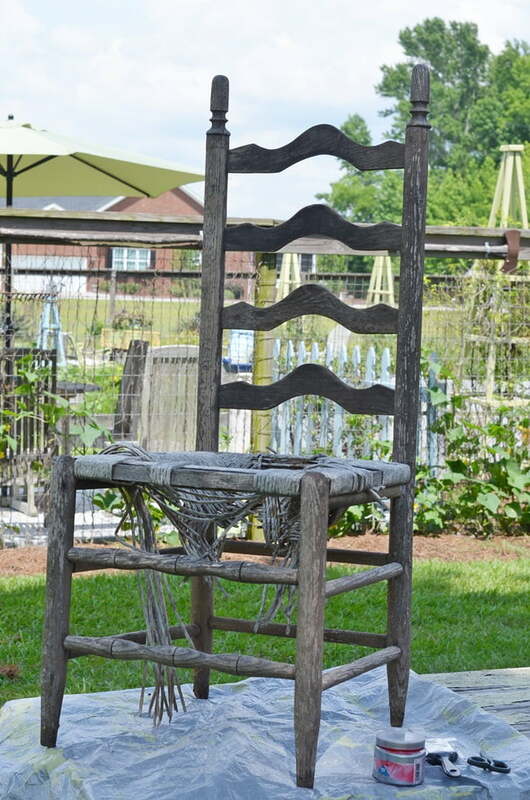 This would look fantasic in my the yard of the house we just purchased! I love the creative elements of this piece. It would look amazing in my flower garden, next to our little patio! I would love to hear the bubbling water, all while watching the beautiful sun peak over our Northwest mountains. I can picture it now! Enamelware is my favorite and you nailed this. Love how it’s all incorporated around that red chair. Thanks for those awesome instructions too. I love what you have created with the enamel pots and the chair.By adding those flowers it really make the fountain stand out. I am looking forward to try and create my own. I have several old chairs and wlll need to start looking for the pots. 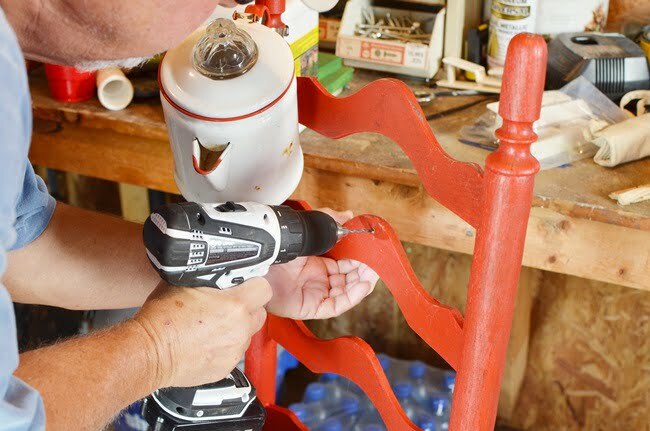 showed this to my husband,he said we can do this.if we could get the pump.He is 72 years old but still likes to try and do what i like.we have some old enamelware and an old chair that could surely work. Such a cute idea! I collect white & red enamelware & have been trying to find a way to display it. I love this! Love it! I have the chair and a couple of the other components. Thanks for another great idea. Off to Lowes. Oh how fun! Makes me want a foundation on my patio outside my kitchen door! Who’d think that something so ordinary would make such a cute whimsical fountain? What a creative force you are! I think I have all but the pump to make my own. Sure hope it looks half as good as yours! now that I stumbled upon your good stuff, I will be reading and looking thru some more. what a great job on that enamelware corner.I loveit!!! and thanks for the great giveaway!!! signed ….your newest follower…. Jane, you & Leo make me feel lazy. Love seeing all your projects. You are both so talented. Oh my gosh Jane, you are so smart and creative!! You always make projects look so easy. Ya’ll did a great job! so creative…. 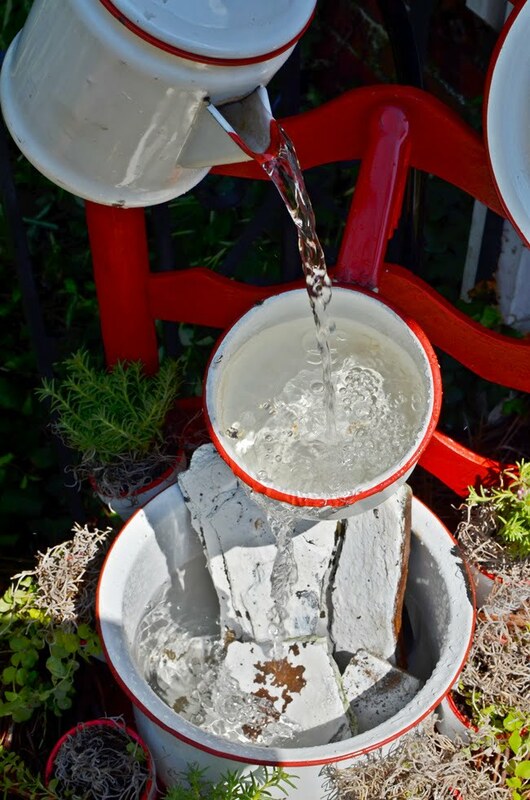 I Love red and enamelware and the sound of water!!! Wow, I absolutely LOVE ❤ this!!! Since I have most everything (not red enamel things but still!) I think I will try it! Thanks So Much for the Idea! What a sweet and original idea! I am a big fan of enamelware, so this project was right up in my alley!! I just happen to have everything except the water pump to make my own version of your chair fountain, so i’m crossing my fingers!!! What a unique idea!! Love the relaxin for kind of water! This is wonderful! I love the sound of bubbling water! Great ideas and thank you for showing how to make it! I need to find this little pump, for this project, as well as a need in my basement. Have burned up two little pumps that ran out of water in the night. Thanks! I would love to win this and let my woodworking son fet creative. Or should I let my son who makes welded metal art have at it. Either way, I know this would be made into something special! What a genius you are! Love Love Love it. Gives me a good reason to do some thrift shopping and add some fun to our courtyard. Love this!!! I have an old chair and have been looking for a project to use it. I think I just found it!! 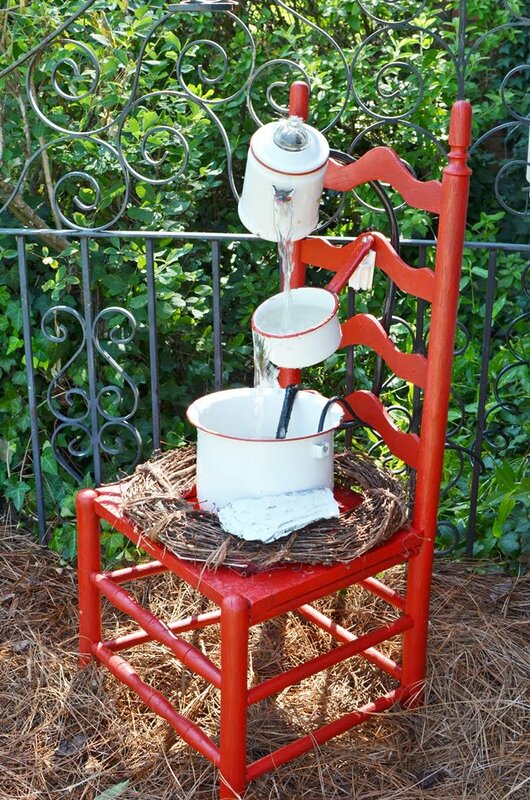 I am sure you smile every time you see your sweet enamelware chair fountain! It is certainly a creative idea! 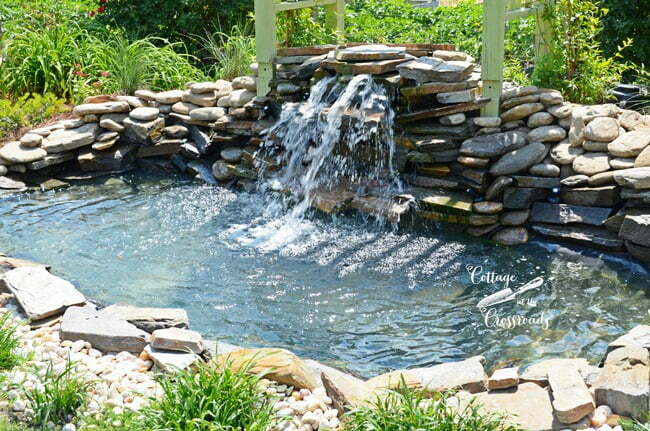 I am in the midst of “remodeling” my front flower garden and I know a sweet fountain like this would look perfect in it! 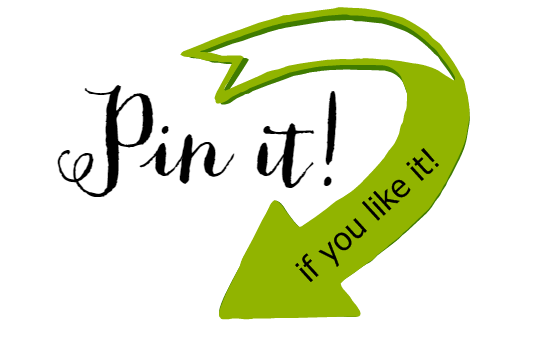 You’ve got my mind thinking of new ideas…thank you! I love enamel ware, I collect the black and white. This is just beautiful! I love it!!! I wish I had your talent. I am always amazed by your creativity. Your life looks like so much fun! This is so darn cute I almost can’t handle it! You always have the best ideas!! You are so talented Jane ! I just love all the wonderful ideas you come up with. So bright & rustic at the same time! Birds probably love the water! I have an old chair that is calling out for a fountain. Glad to know about the pump. Adding this to my “Projects” list. I just love this fountain!! So different and unique! My fav color too.. red. Great job you two! You created & completed a beautiful project Leo & Jane! Very inspiring indeed. I also love the red & white colors. Another awesome creation! I love your fountain. You and Leo are so creative and make such a great team. The sound of flowing water is so relaxing to me. Thanks for sharing. Would love to have a fountain of my own. Absolutely love it! Could not be cuter! I bet the coffee drinking experience is a little better!! This is soooooo adorable and creative. Love love love it. Oh, my gosh!!! This is just about the cutest fountain that I have ever seen. I love fountains and little ponds and would have them everywhere if possible. I love the idea of the pump with the auto shut off. Great idea. Thanks for sharing. 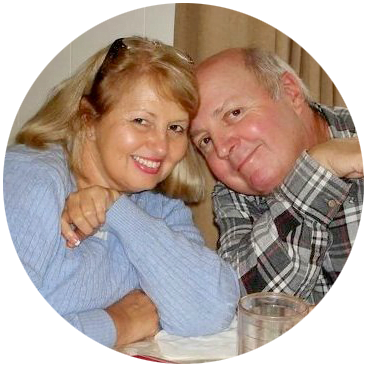 You and your hubby are an awesome duo! What a beautiful set up. I love the country look of the whole piece. Beautiful! Oh my! That’s delightful, there’s nothing like the tinkling sound of water. I have a small, fake water pump. I would love to turn it into a water feature beside my deck. 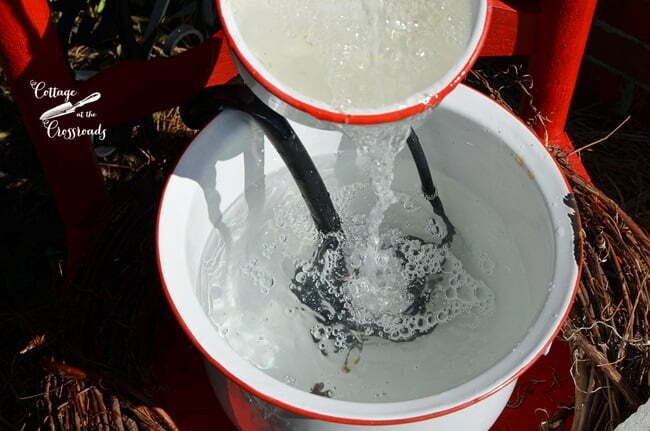 I would hang a galvanized bucket on the spigot so the water would look like it was coming through the pump and filling the bucket. Had to leave my fountain when we moved and so miss it. You and Leo are such a creative duo! Off to look for some pots. Thanks for sharing. I have been into making small fountains this summer to place around. Nothing better than the sound of water bubbling for soothing the soul. I love your red and white planting scheme and the red/white enamel ware. I have an oval wash tub now to find other pieces to add with it for a fun fountain! That is just so cute!! I have a ???? fountain that one of my sons gave me and the pump quit working. Looked a lot like this one, so nice to know where I can find a replacement. It means a lot to me as he is no longer with us. Jane, you and Leo are awesome. I need to make another stop to see you guys. This is the most adorable project! 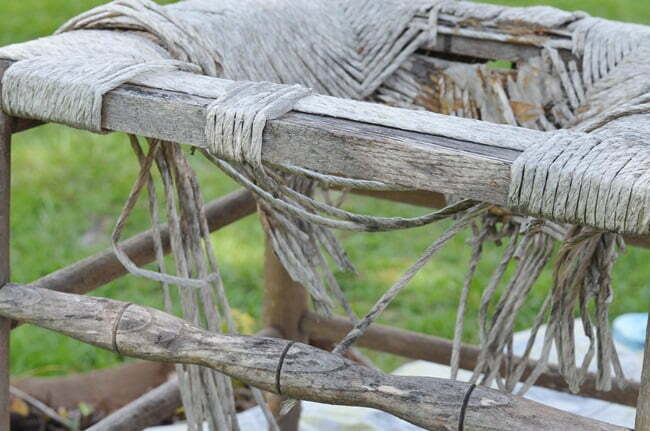 I have an old rocking chair with a cane bottom missing I want to do this project with! Keep your posts a-coming. They are awesome. So is your garden! Wow – what a great idea! 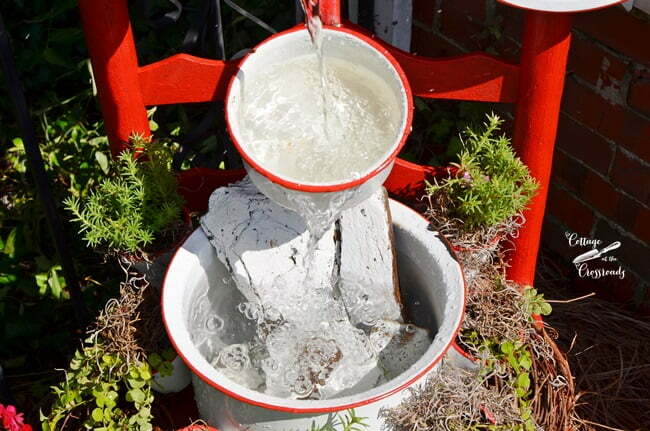 You can use anything to make a fountain and can put it anywhere your pea-pickin’ heart desires! Love it – thanks for sharing! That whole corner is just charming! Y’all did a great job! This is so rustic and adorable! I would love to make a fountain in my yard. Thanks for the chance! Adorable, I love your creativity!! Keep up the great work. Now that is the very cutest fountain I have ever seen!!! Love the Smartpond products and will have to check into that new auto shut off pump as we love to have our fountain (with Smartpond) parts on all the time on our porch! 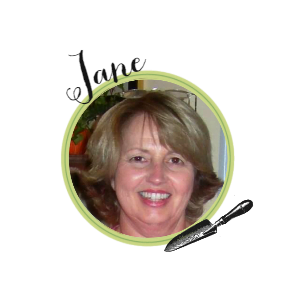 Outstanding creation Jane!! Absolutely adorable! An adorable idea. You and your hubby get an A+. The sound of running water is so soothing. Enjoy your morning coffee together, Blessings. That is so cute! We’re in the process of (finally) buying our first house. I think this idea would work nicely as a deck feature…now to plan a trip to the flea markets and junk shops for “supplies” and inspiration! Always enjoy reading and seeing y’all’s creations. Cute and clever! I adore how all the elements came together with this project! My porch fountain met an untimely accident and I can’t seem to find one I like nearly as much. I should get my creativity ‘flowing’ and make one! ???? That is adorable. So creative. I love it. I love the sound of our fountain every time I walk out the front door. So inspiring! 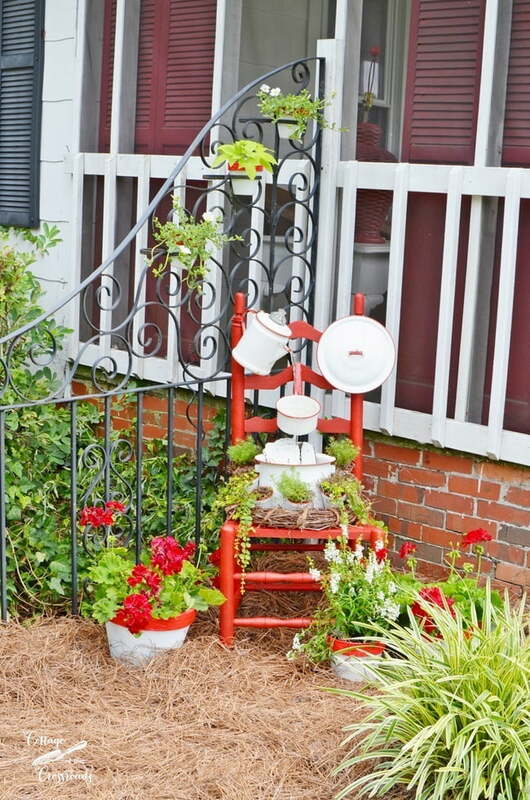 Love the red and white, and the re-purposing of vintage items. This is so stinkin’ cute! I have my husband’s grandmother’s old enamelware kettle. Would love to have a fountain. Thanks for the opportunity. That is simply adorable. I am always amazed at your creativity. SO SO CUTE!